Beijing has been shrouded in orange dust as a strong sandstorm blew hundreds of miles from drought-struck northern China to the nation's capital. The authorities have issued a level-five pollution warning and urged people to stay indoors. In Tiananmen Square, clouds of dust obscured monuments and visitors wore masks to avoid the dust and soil. The storm has already caused havoc in Xinjiang, Shanxi, Shaanxi and Hebei regions and is heading to South Korea. Residents of the South Korean capital, Seoul, as well as those in central and western regions, have been advised to stay indoors. By Saturday, the storm had spread over an area of 810,000 sq km (313,000 sq miles) with a population of 250 million, state news agency Xinhua reported. It was expected to last until Monday, the meteorological agency said in a statement on its website. Guo Hu, head of Beijing's meteorological agency, said the storm came from the deserts of Inner Mongolia. 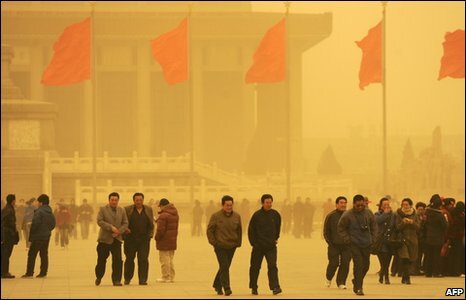 Beijing has long-suffered from sandstorms - including a single instance in April 2006 when 300,000 tons of sand poured down on the city, Xinhua reported. But Mr Guo said the storms had become less frequent in recent years. "The situation improved tremendously after [the 2006 storm]," he told Xinhua. "Thanks to the mild climate and conservation efforts, Beijing had only one sandstorm last year." Experts say the storms are, in part, caused by deforestation and the rapid expansion of urban areas in recent decades.